Union Minister for Road Transport and Highways Mr Nitin Gadkari today said that the Punjab state is on the priority list of the NDA government for carrying out overall development. He said that development works worth thousands of crores are already going on the state and many more are in the offing. He said what the Congress party could not do in 50 years of their rule of the country the present NDA government would do it in five years. Mr Gadkari said this while addressing a public rally organised on the occasion of laying of foundation stone of three development projects worth Rs 3,212 crore, here today. These projects include new Elevated Road for Ludhiana city, four-laned Ladhowal Byepass and four-laning of Ludhiana-Kharar Road that would provide a new direction for the state’s ongoing development. Mr Nitin Gadkari was also accompanied by Deputy CM Mr Sukhbir Singh Badal and other senior leaders.While speaking on the occasion, Mr Nitin Gadkari said that the NDA government is committed for the overall development of the country, in terms of road network and highways. He said that ever since the NDA government was formed around two years ago, they have been working 24X7 and during this time, projects worth thousands of crores have been started in the country. He informed that in last two years, work on road projects worth around Rs 30,000 crore is already going on in Punjab state alone and by next three years, road infrastructure and highway projects worth around Rs 1.5 lakh crore would be carried out in Punjab. On this occasion, Mr Gadkari also announced two new expressway projects for the state, which include a Rs 6,000 crore worth and 508 km long Jalandhar-Ajmer Expressway and Rs 60,000 crore worth and 729 km long Delhi-Amritsar Expressway. He informed that the Jalandhar-Ajmer expressway project would benefit those travelling to Mumbai as people travelling on it would not have to go through Delhi, hence it would help in saving a lot of precious time. He further informed that the new Delhi-Amritsar Expressway would pass through Jind, Barnala and Moga. He stated that the work on this project would start shortly. Mr Nitin Gadkari also appreciated the efforts of Punjab government in terms of power generation and several others. He said that with the efforts of CM Mr Parkash Singh Badal and Deputy CM Mr Sukhbir Singh Badal, Punjab is now a power surplus state.While addressing the gathering, Deputy CM Mr Sukhbir Singh Badal stated that it is only the SAD-BJP government which is committed for the overall development of the state as well as for the welfare of all sections of the society. Taking a dig at PPCC president Capt Amarinder Singh, Mr Badal said that Capt Amarinder has himself stated that it would be his last election. He said this clearly shows that for him (Capt Amarinder), politics is just a business and he does not believe in "sewa" because there is no age limit for serving the people.On Aam Aadmi Party, Mr Sukhbir Singh Badal said that this party as well as its leaders are clearly anti-Punjab and they have also been allegedly involved in several cases of desecration of religious "granths" and have been neck deep in corruption. He said that AAP National Convener Mr Arvind Kejriwal is making rounds of Punjab with a clear agenda of becoming the Chief Minister here. He said that the Punjabis have now very well understood his hidden agenda and would never let him succeed. The projects, whose foundation stone was laid today include a Rs 852.67 crore worth elevated road, which would be 13-kilometer in length and would be constructed from Samrala Chowk to Ludhiana MC Limits. He also laid the foundation stone of new four-laned Ladhowal Byepass that would connect National Highway-95 with National Highway-1. This project would start from near Ladhowal Seed Farm, would be of 17 kilometers and would cost Rs 392 crore. 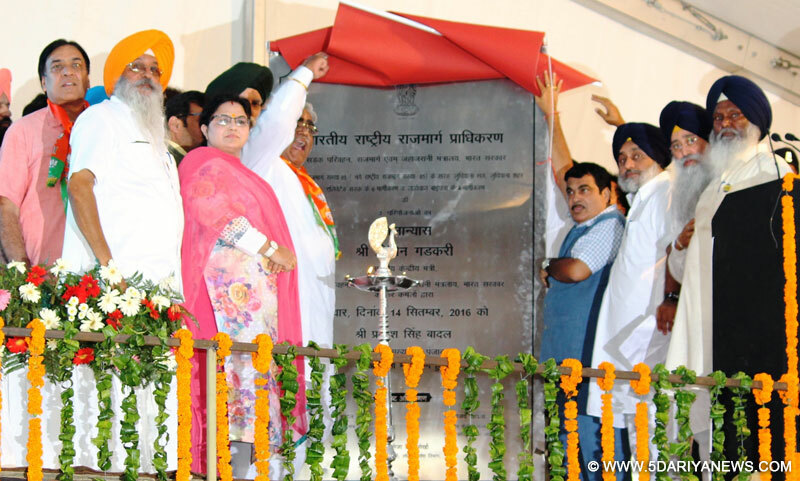 He also laid the foundation stone of four-laning of Chandigarh Road- starting from Ludhiana (Samrala Chowk) to Kharar. This project would not only be beneficial for Ludhiana, but it would benefit the entire state. He informed that this 76 kilometer long stretch of road would be four-laned with a cost of around Rs 1967.32 crore. On this occasion, Mr Nitin Gadkari also announced Ludhiana-Hambran Road as a national highway.Prominent among those present on the occasion included Irrigation Minister Sharanjit Singh Dhillon, MLAs Darshan Singh Shivalik, Manpreet Singh Ayali and Ranjit Singh Dhillon, Advisor to CM Mahesh Inder Singh Grewal, former BJP state president Kamal Sharma, senior BJP leaders Harjit Singh Grewal and Anil Sareen, former ministers Hira Singh Gabria and Sat Pal Gosain, ex MP Amrik Singh Aliwal, Punjab Planning Board Vice Chairman Prof Rajinder Bhandari, Mayor Harcharan Singh Gohalwaria, Improvement Trust Ludhiana Chairman Subhash Verma, Deputy Commissioner Ravi Bhagat, Police Commissioner Jatinder Singh Aulakh, MC Commissioner Ghanshyam Thori, Youth Akali Dal leader Harpreet Singh Shivalik, BJP district president Ravinder Arora, SAD District President Harbhajan Singh Dang, Tanvir Singh Dhaliwal, Narinder Singh Malhi, Tarsem Singh Bhinder, Gurpreet Singh Babbal, Parveen Bansal, Paramjit Kaur Shivalik, Avtar Singh Malla, Nirmal Singh SS, MM Vyas, besides several others.